Jonson Clarke-Harris' last-minute own goal handed Preston North End victory over struggling Rotherham United in the Championship at Deepdale. Tony Andreu gave the Millers the lead when he linked up with Danny Ward to meet his cross and head the ball home. Eoin Doyle capitalised on Rotherham's failure to clear a Preston free-kick as the striker tapped in from close range. With the game heading towards a draw, Clarke-Harris headed Marnick Vermijl's throw into his own net. Preston, who extended Adam Reach's loan from Middlesbrough until the end of the season, move up to 15th in the Championship table while Rotherham remain 21st. Rotherham broke the deadlock when Andreu played Ward onto the left flank before being given the ball back to nod past North End keeper Sam Johnstone. The hosts fought back and almost levelled when Joe Garner latched onto a loose ball to fire goalwards but was denied by Paul Green's superb block. But Preston found an equaliser after the break when the Millers failed to clear a free-kick and Doyle was on hand to tap in from inside the six-yard box. Simon Grayson's side could have taken the lead soon after when Rotherham keeper Lee Camp saved Doyle's header before Joe Mattock blocked Garner's follow-up. 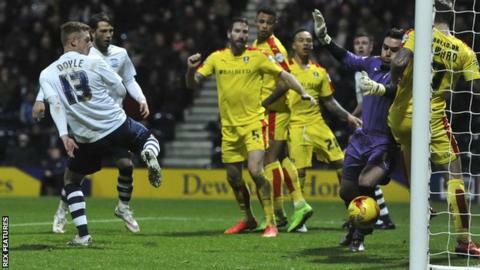 But in the dying moments, Clarke-Harris headed past his own keeper to gift victory to Preston. "I thought first half we were a bit slow in possession, didn't move it quick enough and didn't show enough care. "Out of possession we were a yard off the pace. Rotherham got their noses in front and we knew we might be in for a tough afternoon. "We changed the system a little bit and troubled their back four a lot more. There was no hair dryer. The players are honest enough to know that we weren't good enough and they know what we needed to do." "It was cruel, I felt we played well first half, we went in front and could have got another one. "Then they put us on the back foot at the start of the second half. We had to make changes that we perhaps didn't want to make. We are struggling for bodies. "But we are looking for more resilience. We are talking about seconds not minutes, but we need to be tougher. We have to go again and make sure we pick enough points to stay in this division. We have to dust ourselves down and go again." Match ends, Preston North End 2, Rotherham United 1. Second Half ends, Preston North End 2, Rotherham United 1. Own Goal by Jonson Clarke-Harris, Rotherham United. Preston North End 2, Rotherham United 1. Substitution, Rotherham United. Danny Collins replaces Farrend Rawson because of an injury. Delay in match Farrend Rawson (Rotherham United) because of an injury. Farrend Rawson (Rotherham United) wins a free kick in the defensive half. Offside, Rotherham United. Shay Facey tries a through ball, but Jonson Clarke-Harris is caught offside. Attempt missed. Danny Ward (Rotherham United) left footed shot from the right side of the box is high and wide to the left. Assisted by Paul Green. Paul Green (Rotherham United) wins a free kick in the defensive half. Attempt missed. Alan Browne (Preston North End) header from the centre of the box misses to the left. Assisted by Adam Reach with a cross following a corner. Corner, Preston North End. Conceded by Kirk Broadfoot. Attempt blocked. Joe Garner (Preston North End) right footed shot from very close range is blocked. Attempt saved. Eoin Doyle (Preston North End) header from the centre of the box is saved in the centre of the goal. Assisted by Greg Cunningham with a cross. Goal! Preston North End 1, Rotherham United 1. Eoin Doyle (Preston North End) right footed shot from very close range to the bottom right corner. Assisted by Paul Huntington with a headed pass following a set piece situation. Corner, Rotherham United. Conceded by Sam Johnstone. Attempt saved. Danny Ward (Rotherham United) left footed shot from outside the box is saved in the top left corner. Assisted by Jonson Clarke-Harris. Attempt missed. Alan Browne (Preston North End) header from the centre of the box misses to the right. Assisted by Paul Gallagher with a cross.